Quite useful information for muslim in Japan about tourism, food, activities, restaurant , hotel, clothing and so on. E-book about a state of Halal in Japan is published. 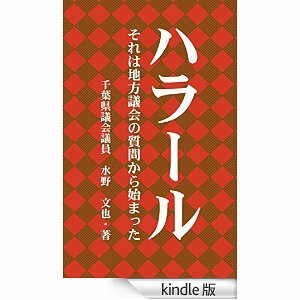 “Halal – That started from a interpellation in a local assembly” is written by Fumiya Mizuno as a member of the prefectural assembly of Chiba Prefecture.It’s ebook is written in Japanese. With the heightening concern toward “halal” in Japan recently, it explains the background about “Halal”‘s fever, and can use as an easy-to-understand introduction to “halal”. In Japan, one of the current problem about halal is increase in certifications lacking in rigor or strictness.This ebook also referred to that. ← JAPAN HALAL SEMINAR 2014 at CONRAD TOKYO supported by JAKIM,IKIM,and HDC. Copyright © muslimfriendly.jp مسلمون ودية All Rights Reserved.